The Luxury Travel Bible loves the much-heralded service offered and delivered at Deer Valley; no wonder it has been voted the Number One Ski Resort in North America by the readers of Ski Magazine for an unprecedented five out of the last six years. Deer Valley is one of three ski resorts in Park City, Utah, which claims to have the 'Greatest Snow on Earth' and was also named as one of the best 25 ski towns in the world by Conde Nast. What sets Deer Valley apart is that it was established to be the first ski resort in the world to offer five-star service on and off the snow. There is no doubt it has succeeded, with a swag of ritzy lodges, resorts, condos and luxury homes to stay in, a raft of options for fine dining and runs that are as beautifully prepared as the fairways at Augusta. The Resort's dedication to service is evident as soon as our hotel shuttle bus pulls up at the ski resort car park. A beaming Ski Valet helps extricate our skis and poles from the back of the van and hands them over. He then points out the Ski Storage center tucked into the corner of the Snow Park Lodge, informing us that when we have finished skiing for the day, we simply hand our skis and poles over and grab then again the next day. So much better than lugging all that gear to and from the hotel. And it's complimentary. It is these little things that demonstrate Deer Valley's total dedication to providing a service guests are not likely to forget. Perhaps that is why a constant stream of celebrities can be spotted on the slopes, including Will Smith, Katherine Heigl, Brad and Angelina, and Justin and Selena. Katherine and Will like it so much they have houses here. Go while the Sundance Film Festival is on and your head will positively spin with A List sightings. Antonio Banderas is there at the same time as us, but unfortunately, we don't bump into him. Shame. 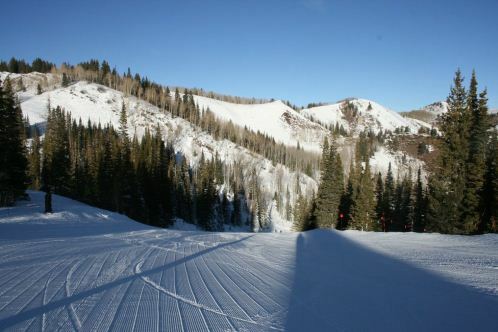 Deer Valley has six mountains - Bald Eagle, Little Baldy Peak, Bald Mountain (9400ft), Flagstaff, Empire (9570 ft) and Lady Morgan - with 100 ski runs and six bowls, accessed by 21 chairlifts. It can be easy to lose your way, so we chose to do the guided tour with a Mountain Host. Like most ski resorts this is a free service, but unlike most ski resorts, the Mountain Hosts at Deer Valley are paid. This way, they attract the best and can keep them. There is something for skiers of all abilities at Deer Valley, with plenty of learning areas for beginners, many blue runs for intermediates and a radical assortment of blacks and double blacks. There are also several gladed areas, where capable skiers can breeze between stands of aspens. The ski school caters for all ages, and like everything at Deer Valley, is exemplary. Budding Olympians or those who just want a thrill, can tackle the Bald Eagle Mountain runs that hosted events in the 2002 Winter Olympics - Champion, Know You Didn't and White Owl - or see what its like to race down a slalom track on the fully set up NASTAR race track. It does set the heart aflutter when you're in the start gate, counting down and then hooning down the hill, trying not to miss the gates. We do this countless times and the good news is that it is very good value for money - US$2 a race or $29 for 12 runs. Deer Valley has 11 restaurants, with Cushings Cabin on Flagstaff and Snowshoe Tommy's on Bald Mountain excellent for a hot chocolate break or a leisurely lunch. For a more lavish lunch, Royal Street Café at Silver Lake Lodge is superb. For a few apres ski drinks, the in-crowd head for Troll Hallen Lounge at Stein Eriksen Lodge or The Bar at the St Regis, where the signature drink , the 7452 Mary will give your taste buds a kick. For pure fun, do not miss Daly's Pub at The Montage Deer Valley, a magnificent resort you can ski to from Flagstaff Mountain. Daly's is the place you would build yourself if money was no object and you liked playing games. There is a bowling alley inside, plus pool tables, dart boards, huge TV screens, comfy lounges, cowhide barstools and incredibly good food. Be warned ... go for an hour and you might stay for four. For dinner, there are many exceptional experiences to enjoy, with the award-winning Seafood Buffet at the Snow Park Lodge and the Fireside Dining at Empire Canyon Lodge traditional favourites. Don't be turned off by the word 'buffet', it is rated as one of America's Top Restaurants by the Zagat Survey. Historic Main Street in Park City, just a five minute drive from Deer Valley, abounds with restaurants and colourful saloons, but for something special, try Talisker on Main or Silver. Families should head for Bandits or Butcher's Chophouse, which are both fantastic. The ribs are highly recommended if not a little messy. If you can bear to tear yourself away from Deer Valley's snowboard-free slopes, consider a day or two skiing at Park City Mountain Resort, or the very-chic Canyons Resort, both just a very short drive from Deer Valley. The Canyons has an upbeat vibe, thanks to many millions spent on infrastructure over recent years. The skiing and boarding is sensational, with nine mountains and 182 trails to explore. It's worth skiing there just to have lunch at the Lookout Cabin, at the mid-station of the Orange Bubble Chairlift. The food is exquisite. Park City Mountain Resort is known for its terrain parks and for its enormous half pipe, but also has many stunning groomed runs. Look at some of the historic markers around the mountain that show where some of the original silver mines used to be. And of course, no skiing holiday would be complete without doing some shopping, and at Park City's Tanger Outlet Malls, you can give your plastic a workout at many designers stores, such as Calvin Klein, Ann Taylor, Coach, Nike, Oakley, Abercrombie and Fitch and Polo Ralph Lauren. Just make sure you have room in your luggage ... Louis Vuitton of course. Elegance on snow - The ski-in, ski-out Montage Deer Valley Resort is magnificent in every way; stunning on the outside and uber-chic on the inside. It is all about the location, with several beautifully designed spaces to sit and drink in the view over the snow-topped mountains. It is elegant without being pretentious, refined yet casual. The rooms and suites are divine, and the Spa Montage is a dream. It would be easy to spend a day or three immersed in it. Sophistication slopeside - St Regis Deer Valley sits atop a hill, almost like a fairytale castle, looking over its kingdom. Stay there and enjoy the attention of the famed St Regis Butlers, who will unpack and pack for you, organise dinner reservations and even deliver you a pot of tea or coffee in the morning. The Head Butler, Alexander Mattinson worked at Buckingham Palace, so these butlers are the best of the best. If you're not staying there, look on longingly at the heated pools when you ski past. At the very least, go for a drink or have dinner. Canyons Cool - The Waldorf Astoria is five star all the way, offering guests timeless luxury in the grand Waldorf Astoria fashion. If you want to stretch your platinum credit card, stay in the six-bedroom Presidential Suite - the kitchen is vogue all the way. One of the highlights of the Waldorf Astoria is the Goldern Door Spa. Just the memory of the massage I had here sends me into a dreamlike trance. Drink up - the mountains here are higher than Australia, so make sure you keep hydrated by drinking plenty of water. Salt with that? - Before flying out from Salt Lake City, why not stay a night? Salt Lake City is a city that's well and truly on the radar as a place to watch. Visit the brand new Utah Museum of Natural History - the design will undoubtedly win a swag of architectural awards, and have a look at the enormous Temple Square, home of the Mormon Tabernacle Choir and the headquarters of the Mormon faith. The incredible Salt Lake Temple, visible for miles around, took 40 years to build. Stay at the Grand America Hotel, which lives up to its name. It's exceedingly grand, and is famous for its High Teas. You'll need to pull out your best designer gear, as it is a see and be seen affair.